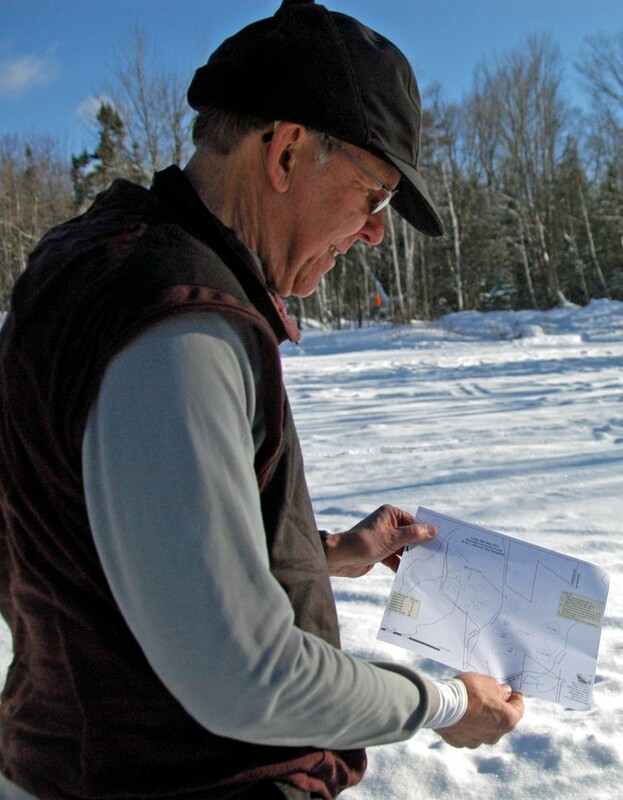 Editor’s Note: When it was first created, the Randolph Community Forest might have been named, “The Randolph Town Forest.” The word “community” was selected, however, because it spoke to residents beyond town boundaries, in the hopes that the forest would engage North Country citizens in nearby towns, as well. And, that’s exactly what has happened. Coos County Democrat reporter, and former Randolph Forest Commission member Edith Tucker, recently reported on a visit to the RCF by students from nearby White Mountain Regional High School in Whitefield. The visit was one of two the students took that day. With Edith’s permission, we’ve reprinted the portion relating to their visit to the Community Forest, below. 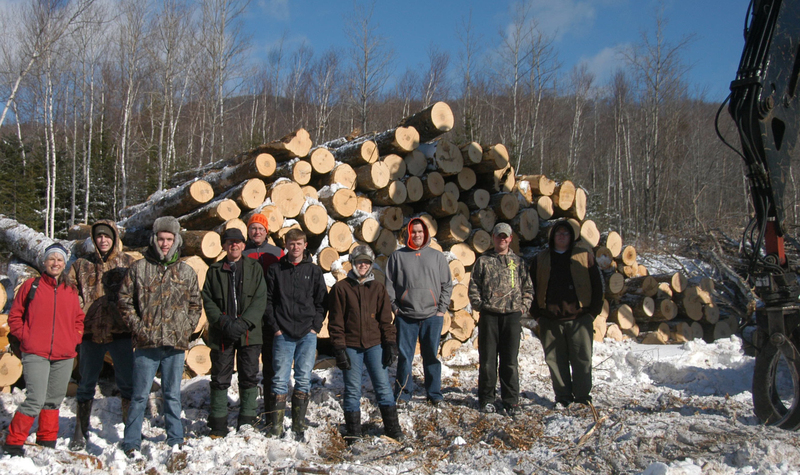 JEFFERSON — Seven of the 12 students in Natural Resources teacher Jenn Barton-Scarinza’s double-period CTE class at White Mountain Regional High School took a field trip on Thursday, Feb. 20, to two active logging sites in the WMR School District. They lucked out on the weather: bright sunshine, little-to-no wind, and temperatures in the 30s. First, on the Randolph Community Forest (RCF) licensed forester Walt Winturri, who spent his career in the Androscoggin Ranger District of the WMNF, talked with the students about some of the factors that go into developing a 10-year forest management plan that guides what he does on the ground when he lays out a timber harvest to ensure that it is sustainable. The acreage in the 10,000-acre RCF, he explained, has been commercially harvested for over 100 years, first by the Brown Lumber Co. of Whitefield and then by the Brown Company of Berlin and its successors. The Boston-Mass.-based Hancock Timber Resource Group (HTRG) bought the property some 20 years ago when the pulp-and-paper mill owners severed the manufacturing end of papermaking from growing and harvesting trees for fiber. WMRHS Natural teacher Jenn Barton-Scarinza, left, WMRHS students Dakota Lurvey and Matt Huntington, licensed forester Walt Winturri, WMRHS para-educator Rick Bedell, WMRHS students Forrest McCabe, Rebeka Kenison, Scott Huntington, Eli Walters, and Joe Patenaude spent Thursday, Feb. 20, on a field trip and visited the Randolph Community Forest as one of two stops during the day. No machinery was operating when the photo was taken. After the ice storm of 1998, HTRG decided to sell the property and concerted efforts at the local, state, and federal level resulted in the town of Randolph with a population of just over 300 people owning the largest “working” town forest in the East, all subject to a conservation easement, with no cutting over 2,500 feet in elevation. Some 1,100 acres are in Jefferson. “Trees put on new growth every summer, increasing both their height and diameter, increasing the timber volume per acre,” he explained. “We only want to capture that growth and no more so the forest will be harvestable years into the future. Wood is a renewable resource, but we don’t want to cut too much of the annual growth.” He also emphasized the importance of other forest resources, including aquatic habitat to support fish and other aquatic species, soils, and wildlife habitat. Licensed forester Walt Winturri, formerly of Gorham and now of Plymouth, discussed with WMRHS field trip students how the current tree harvest taking place in Jefferson on the Randolph Community forest produces revenue, improves wildlife habitat while protecting the water and soils, supports the local economy, and welcomes snowmobilers, hikers, anglers, hunters, birdwatchers, backcountry skiers and sled-dog mushers. Barton-Scarinza explained that logging contractors working on the town-owned property use Best Management Practices (BMPs). Winturri, working with John Severance and Elise Lawson of Watershed to Wildlife of Whitefield, worked on the first management plan once Randolph acquired the forest. The team’s second 10-year management plan was just accepted by the Randolph Forest Commission in Dec. 2013 and is awaiting state approval. “By working on the forest and preparing several timber sales, I gathered more information than the first time around — many nuances and a greater understanding of the variables on these stands,” the forester said. Forrest Hicks of Hicks Logging in Jefferson submitted the high bid for the project and won the contract. Hicks, in turn, employed SDS Logging, also of Jefferson, to do the work. The wood chips hauled from the on-site chipper have gone the short distance to Whitefield Power and Light, owned by Korea East-West Power, with a few loads heading to Pinetree Power in Bethlehem, owned by GDF Suez, Paris, France. Pulpwood has been hauled to the paper mill in Skowhegan, Me., as well as the chip plant of R. J. Chipping Enterprises, Inc. in Shelburne, to be readied for shipping to the paper mill in Rumford. Sawlogs are hauled to a concentration yard in Colebrook, ready to be exported to a buyer in Canada where they are processed. Some dimensional lumber will likely will be shipped south to the U.S., others across the continent in a train and be shipped cross the Pacific Ocean to China. This timber sale will provide 410 thousand board feet of sawlogs, primarily sugar maple, and 3,500 tons of pulpwood, which translates to 85 tractor-trailer loads of sawlogs and 155 loads of chips and pulpwood. 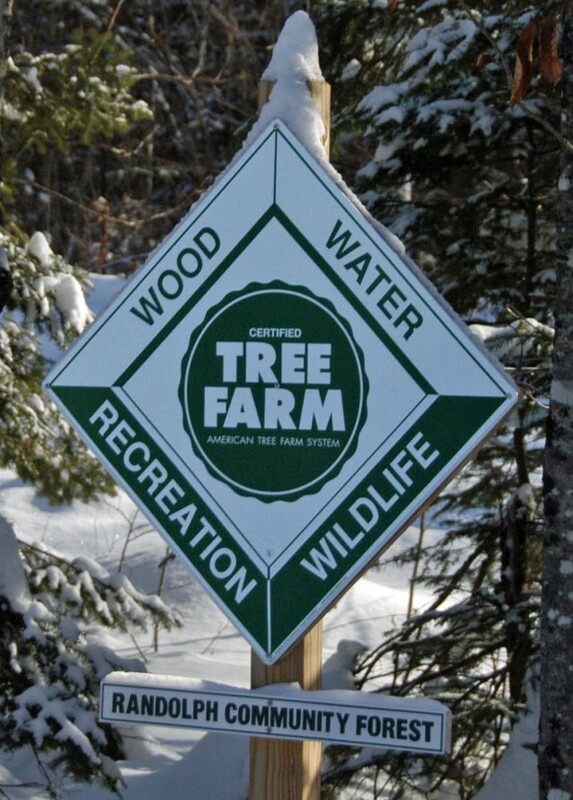 The Tree Farm sign, indicating that the Randolph Community Forest is certified, highlights the goals of the nationwide American Tree Farm system.